MapQuest maps are still the preferred mapping solution by many companies and individuals. They have a sleek appearance and look great when integrated in your website. With our MapQuest Maps integration, your customer's will see your nearby locations displayed on a map on your search results page. Comes complete with Zoom In/Zoom Out controls and the sleek look and feel of MapQuest within your website. 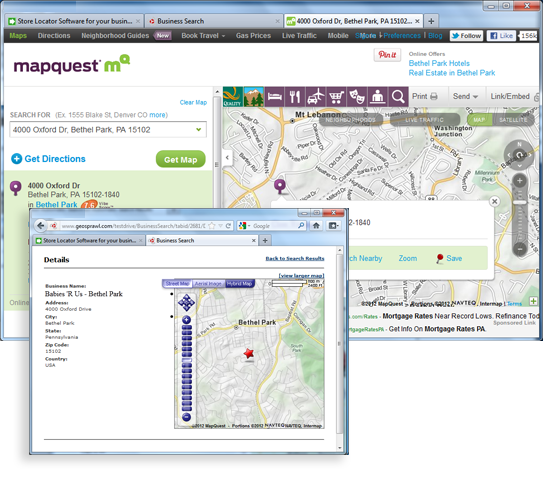 Your customers will even be able to click on a link to open the full page mapping details on the MapQuest site!